The C of E’s General Synod decided against ‘taking note’ of the report (file photo). Conservative and liberal members of the Church of England have voted against a report which both backed the biblical definition of marriage and called for “maximum freedom” for homosexual people. 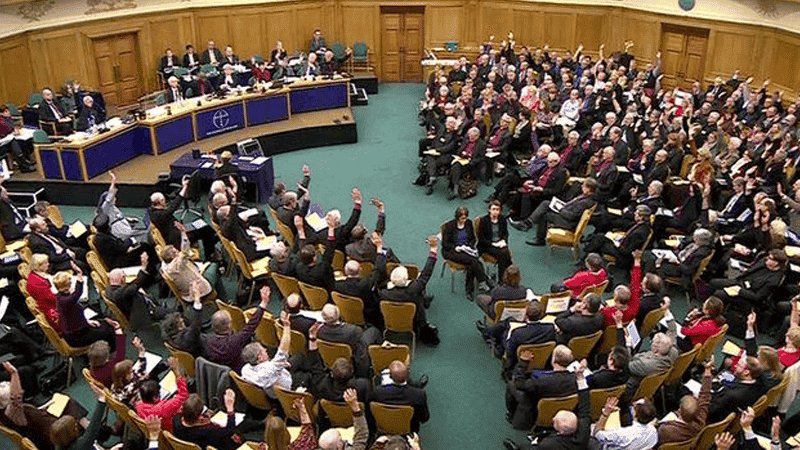 The C of E’s General Synod decided against ‘taking note’ of the report at a meeting in London. Bishops gave their full support; lay members of the Church from around the country backed it by 106 to 83; but clergy rejected taking the document forward by 93 votes to 100. Critics say the House of Bishops’ report was very confusing because although it left the definition of marriage intact, at the same time it backed a greater role for practising homosexuals in the Church. Anglican group GAFCON had criticised the report for ‘confusing pastoral sensitivity with a permissive church culture’. Evangelical Church of England minister Melvin Tinker had warned that the report ‘looks both ways’ on sexuality. He said it gives the impression of “business as usual” while also moving in a revisionist direction. Urging the Church of England to act courageously for Christ, he said evangelicals “who wish to maintain their integrity have no option but to embrace the theology of the cross and all that that entails – suffering and rejection”. Pro-gay activists welcomed the Synod result, claiming the report showed the Church was “lamentably out of step” on the issue of sexuality. The document, produced by the House of Bishops, had called for a “fresh tone and culture of welcome and support” for homosexuals in church life. The report went on to add that there was agreement that the existing law and guidance should be interpreted to “permit maximum freedom within it, without changes to the law, or the doctrine of the Church”. Andrea Minichiello Williams, a member of the General Synod and CEO of Christian Concern, said the result meant “no change in doctrine or practice”. She called on Bishops to “lead with clarity and authority”, holding out God’s way of life and liberty, rather than seeking the “approval of the world more than the love of God”. Bishop of Norwich Graham James said the House of Bishops would “consider carefully and prayerfully all the contributions made in the debate”. “Our report did not bring proposals, it brought a framework and a request for Synod to tell us what they thought. We have listened to those who have spoken, and those others who have made contributions to us directly”, he added.